When two American sisters travel north from Ho Chi Minh City to Hanoi, conversations with Vietnamese strangers and friends reveal to them the flip side of a shared history. Lynne and Dana Sachs' travel diary of their trip to Vietnam is a collection of tourism, city life, culture clash, and historic inquiry that's put together with the warmth of a quilt. 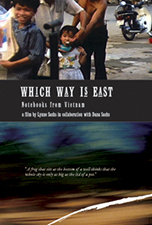 WHICH WAY IS EAST starts as a road trip and flowers into a political discourse. It combines Vietnamese parables, history and memories of the people the sisters met, as well as their own childhood memories of the war on TV. To Americans for whom "Vietnam" ended in 1975, WHICH WAY IS EAST is a reminder that Vietnam is a country, not a war. A portrait of a doctor who saw the worst of society and ran.